Have you already heard about The Black Friday Event which is now available at U.S. Timberland Specialty Stores and Timberland online? 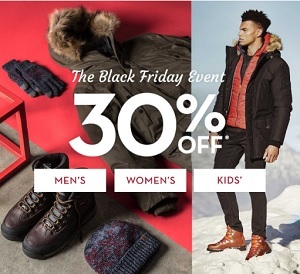 You have an unique chance to save an extra 30% off selected styles. Free 3-Day Ground Shipping on all online orders + free returns. Source of the information is Timberland. Offer is valid until November 27, 2017. For more details visit any U.S. Timberland Specialty Store or Timberland online.